A digital-only prequel story is be on the way next month to tie in with this Autumn's big screen Dredd film. The book, simply titled Dredd 3D, will act as a lead in for the Karl Urban movie that's set to open on September 21st here in the States. It's no toss away read though, so don't judge (get it?) 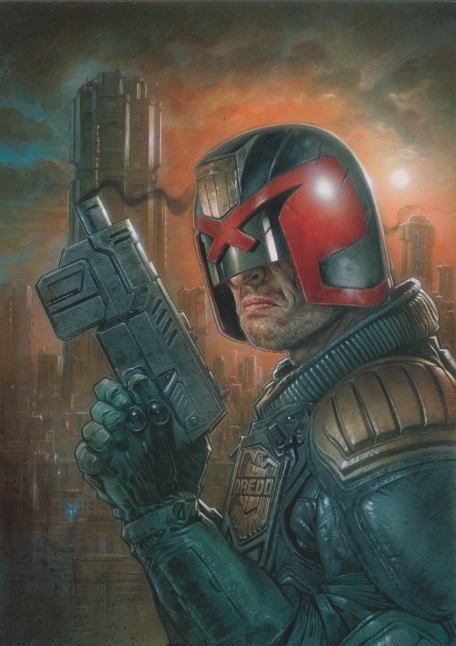 it too quickly, as Dredd 3D will be written by 2000AD's Matt Smith (he kinda knows the source material). It will also feature the first comic appearance of the film's main bad-gal, Ma-Ma (Lena Headey of Game of Thrones fame). There's no exact date as of yet for the comic (it's just listed as August), but you can have a peep at its cover today- the hand drawn piece by Greg Staples is shown above.